When you back to the editor, you can adjust the gadget properties to get the size and characteristics you want. Many news sites and blogs generate rss feeds which allow you to embed content from their site in yours. For this you need a special gadget. Again you can probably find one with insert/gadget, but it's easy to build your own. That allows you to do some fancy things, like only showing the feeds when hovering over an image - and dynamically adjusting the height to accommodate a particular number of posts. I like to do this because I don't want my site real estate to be dominated by feed links. Hovering over them reveals them. Below is the feed from my blog using this gadget. 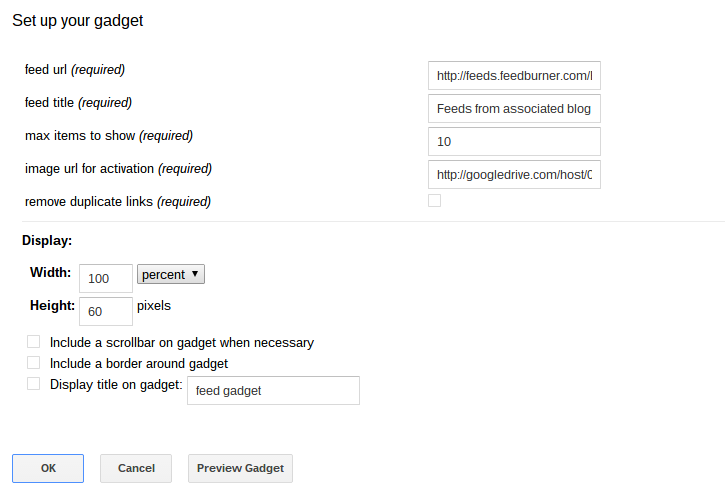 Here's how to use the Google Feeds API in a gadget to manage your feed. feed title. This will be shown next to the image and as a heading for the feeds. max items. This is the maximum number of feed items to show. You should set the height of the gadget to a small amount. It will be automatically adjusted to fit your RSS image, and then the number of feed items you want to display. in the feedurl parameter in the gadget gives me the feed below. It's not actually a proper feed so it has a bit of hackery built into the gadget to figure out the link and remove duplicates. Here's the code for the gadget. // display the feed items.